Handmade Scrabble Letter on Chain Pendant on a Silver Plated chain. So very fashionable and fun to wear A Vintage Scrabble Tile is top-drilled then threaded onto the chain with 2 heart shaped pearlised pony beads. Price from £4. Such a HOT fashion accessory. Choose your Scrabble Initial, write the heart colour in the box, choose either Pink, Sparkling Red or Purple, and choose the chain length you want. 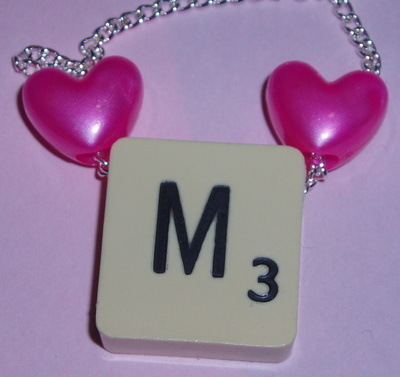 I recycle Vintage Scrabble Letters so your necklace will be made using thick round back black letter tiles. IMPORTANT - J's and K's are in short supply, so any jewellery with these letters may take up to 10 days to process and dispatch. Normal dispatch for all other letters is 4 days just now.